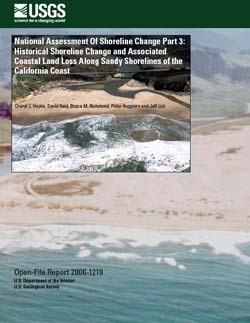 "National Assessment of Shoreline Change Part 3: Historical Shoreline Change and Associated Coastal Land Loss Along Sandy Shorelines of the California Coast" is a 79-page, full-color discussion of historical shoreline change and coastal land loss along the U.S. California coast. Standard-quality version: of2006-1219.pdf (3.9 MB PDF). This version was produced at 300 dpi with jpg-medium (lossy) compression for smaller size. It looks good on the screen, contains "bookmarks" in the margin, and makes a fairly good printout. High-quality version: of2006-1219_hi-qual.pdf (87.7 MB PDF) This version was produced at 300 dpi with zip (lossless) compression for sharper images. It is over 20 times as large so only download it if you want to make a particularly good printout. Plain Text version (open this file in any text editing program): of2006-1219.txt (308 KB ASCII). This version is raw text and has no illustrations.